We finally had the chance to photograph a wedding here in our tiny burg of Pine Lake. Jen and Stacey, former residents, chose the clubhouse as the location of their laid back October festivity. Their intimate wedding ceremony took place on the clubhouse lawn under the pine trees. Then the party moved indoors (well, most of it did) for food, drink and dancing. Wedding and reception were both kid-friendly, which proved useful. Entertainment, in the form of singing and dancing, was provided by several of the younger folks in attendance. 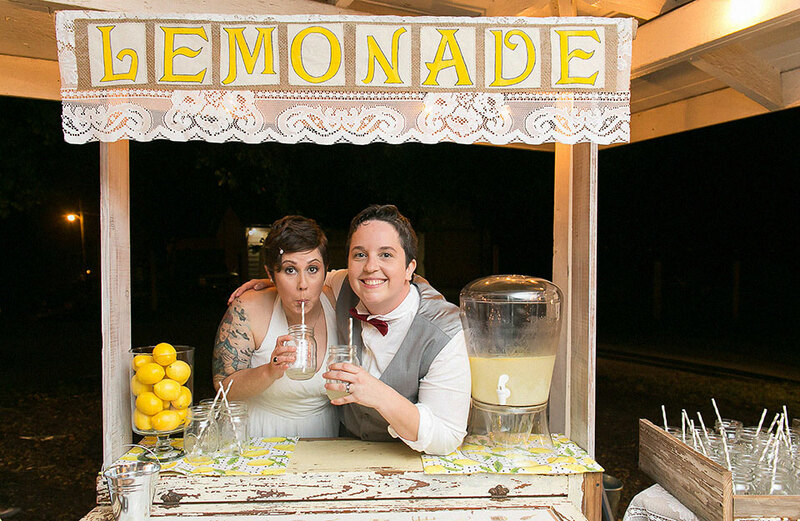 A lemonade stand made by Jen's Mom was a highlight of the decor. And corn hole on the lawn prompted many laughs.